It's not such a secret anymore that Ireland golf vacations may be even better than in dear old Scotland or anywhere else on the European tour, maybe better than anywhere else in the world. The Irish courses, some links and some "parkland" style (more lush and manicured, like American courses), offer a combination of history, knock-your-socks-off scenery and, of course, very challenging golf. I'm most familiar with the courses in The Southwest. Here's a taste of some of the most famous dream links in this part of Ireland, and some information about a special tour operator I've chosen for our readers. Golfers all seem to sense that Lahinch is special, even if they can't explain the precise reason. The old course that's #1 on just about everybody's "must play" list. Greg Norman's piece of work in Clare is georgous, but it will make you work. A hot new stop on an Ireland golf vacation for many. The ups and downs of history have, in the end, blessed Waterville in unique ways. A course that teaches you the benefits of match-style play. The sea, the mountains and the dunes frame this classic links. This lush parkland course and Georgian mansion offer a high-luxury getaway. A classic western links by the sea that will make you work hard to come out with a respectable score. An "otherworldy" landscape and a super-tough layout make for a memorable golfing experience. A great stop near Dublin while you're on your Ireland golf vacation. 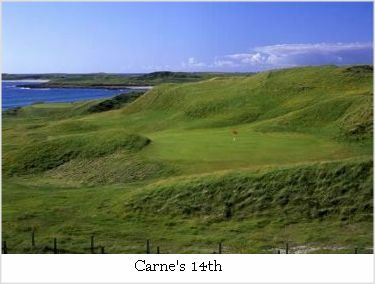 Sitting on the Atlantic cost in County Mayo, Carne is an world-class course where you may find yourself alone. If you consider a career in travel and tourism then start your learning with a trip of your own.